These days there are so many websites and resources available to help teachers, but that doesn’t mean that teachers know what all’s available to them. There’s so many lists of websites out there, but what makes this one unique is that these websites have been recommended by teachers themselves. Thank you to all the teachers who submitted your favorite website! A disclaimer, though: I have not personally vetted these websites. 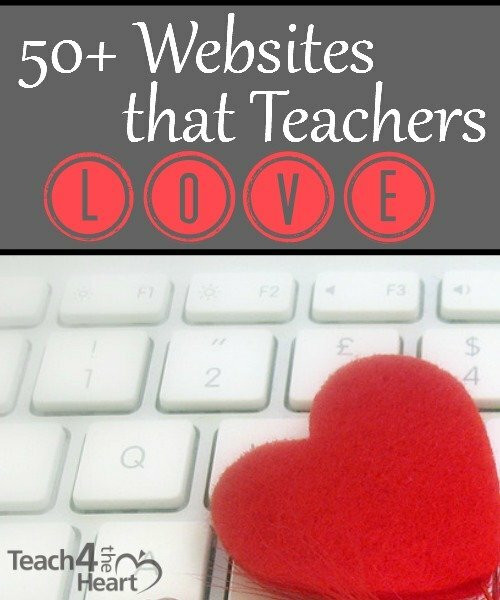 I’ve simply compiled a list of websites that teachers love and recommend. I hope it will be helpful. And help make this list even better by adding your favorites in the comments! Read Theory – Sign up for free and gain access to over 1,000 reading comprehension exercises. CNN Student News – a ten-minute, commercial-free, daily news program designed for middle and high school classes. Teach 4 the Heart. That’s us and you’re already here. If you like the site, click here to sign up for updates. Is your favorite website not on the list? Add it in the comments below. Quantum Technology could be remaining in its nascent phase and seem similar to the 1950’s of classical technology. However the entire world is watching and patiently waiting with expectation at the likely breakthroughs that might come from quantum computing. Thank you for listing us as one of your 50 BEST!!!! Thank you for adding Dear Teacher/Love Teacher to your list! You are awesome! So sorry…the website is: http://www.maryevethorsonscholarshipfund.com. The monetary awards are for 8th grade students. Please pass the link along if possible. Thank you again. All websites are quite good and it helping teachers a lot. Moreover I have seen some teachers and student are using http://stunited.org. This website is more comprehensive and user-friendly fit for teacher, student and parents. My favorites are starfall.com for younger kids, incredibox.com for older kids interested in technology and powermylearning.com. All free! E-learningforkids and Sheppard Software – both free and amazing!! Help Teaching (www.helpteaching.com) is great resource for those looking for common core aligned Math and ELA worksheets. Great work. http://www.edugain.com is another good website for printable Math worksheets. most of the websites ask for money ,why there is not free good website !!! There are some great websites out there that are free and quite a few of these are. But when you think about it, someone has to put a lot of time into creating an awesome website & resources. And unless they are already a millionaire, they need to make an income somehow. People can start a website on the side while they still have a full-time job. But if they want to get serious about creating an amazing website they can’t do with just a few hours a week. They need to do it full-time, which means it has to make money. I am contacting with regards to my educational site for primary school teachers and children http://www.teachingcave.com. It is a site which offers a variety of free and paid resources for primary school teachers and parents. I am a primary school teacher based in Northern Ireland and TeachingCave.com is based on the NI Curriculum (although we have members worldwide). The site has been designed so that children can navigate easily through the areas of learning to find the learning games and resources they need. Kahoot is a great website to use with the kids in school!! You can make your own games or use public ones and duplicate to make them your own. It requires access to an iPad or a smartphone. It is GREAT!! The students go to kahoot.it and wait for a game pin that you project for them on the screen from the getkahoot website. They answer questions by tapping the right color of the choice on their device. They compete through speed and accuracy. The kids LOVE it!!! There is fun music and the ability to upload images and videos. Buena Suerte!! For our special needs students, http://www.AutismEducators.com offers tons of free activities, a free IEP goal bank (with FREE customized goal writing now available through their Pinterest and Facebook page), and a Teacher’s Wish List where items are purchased for you! This a great resource for teachers! Would you mind adding our website? A FREE website for teachers to buy and sell used teaching supplies. Thank you for this beautiful collection…. I have been going through it and its really useful. One may get ideas as well to modify the things given as per the context. Great List! I appreciate the time you put into pulling this together. There are a few resources I was not aware of before. All teachers would benefit from my life saving skills eBook on amazon kindle. Please visit my website and watch video slide show of First Aid in Rhyme. You will see email I received from Debra Wind on behalf of Nicky Morgan suggesting I contact learning providers, colleges and local authorities to share details of it. Point Production and Design Teacher Resources. Be sure to check out http://www.pointpro.com.au for quality downloadable teaching resources. New resources are being added regularly. Typing Tournament Online http://www.typingtournament.com is a new web service designed to teach children to type. It is suitable for use both at home and school and operates on Mac and PC computers, iPads and Surface and Android tablets. Typing Tournament Online has been over 12 years in development building on the old CD based product Typing Tournament. The powerful new version is totally transformed with over 100 enhancements that make it easier for children to learn to type and more powerful for teachers. It is full of innovative features that combine to help children use the right fingers on the right keys and motivate them to learn and is informed by our in-class research program. It supports children to work independently by reading aloud the key instructions. Uniquely it uses a bespoke on-screen keyboard to overcome the serious issues arising with the inbuilt soft keyboards on mobile devices. It uses a powerful combination of mastery learning, teaching sequences and games to motivate children to learn the vital skill of keyboarding. Typing Tournament Online can be used anywhere there is an internet connection. The fully featured school management system allows the importation of lists of children and has advanced report that put teachers in control. Typing Tournament Online is a truly revolutionary service that empowers children to learn the vital skill of 10 finger typing. Please consider adding my Dyslexia & Intervention Coach website. It has a lot of info for teachers about kids who learn differently or struggle to read. Thank you for your consideration and God bless. Thanks a lot. I’m going to have a look at them. For basic facts about different countries, I use http://nationfacts.net with my students. When God created the kindergarten teacher, he was already the sixth day of working overtime. she must have her back that which all can endure, and to live predominantly in bowed position. God nods affirmatively : “One pair that sees through closed doors, wile she asks: What are you doing there? And she already knew everything. Another couple at the back, with which she sees what should not, but what she has to know. “I can not” God replied, “I’m close to create something that somewhat resembles. “You really are a genius, Lord!” said Angel ..
All very true and useful information, Thank You for this! I would like to share that while everyone knows that Skype can be a powerful tool for homeschooling and online learning but have you heard about Zoom webinar software and real time whiteboard for building custom whiteboards for the English learning classroom? I have been using Skype for business English lessons as a business English teacher and it is so much better to have one-on-one lessons to help students learn language. Now, I have discovered Zoom I don’t think I will ever go back to Skype. Please be sure to give Zoom and real time whiteboard a try they are useful tools to consider. A lot of teachers have been using it for Teaching students about the legislative process, Finding a piece of legislation by identifying issues you care about, and writing a persuasive essay about it, and Helping students understand how current events lead to new bills. Free Printables for the Classroom! Thank You so much for these awesome websites and resources!! Include a website http://www.beyondteaching.com/ It is a leading site on the news, Jobs, stories, innovation and blogging for the teachers. I’d like to suggest Gabriel’s Seeds http://www.gabrielsseeds.eu – learning apps generator that makes so easy to create personalized and engaging online lessons (K-3) in minutes. Great list! Lots of resources here as well: http://www.brightclassroomideas.com/2017/04/23/top-50-edublogs-2017/. They provide resources for ESL and special education students. Students can take online courses to help with different subjects. You can also ask them to create a course for you. Thanks for this great list. You can add https://www.englishtestsonline.com/ to list for English teachers and learners. Thatquiz is a really cool math website where it also calculates the average grade! Makes stuff easier for you! Also my lowest grade students, Sheetal and Hans Raj are doing well in class too! Hi! My husband’s website ToyTheater.com is chock full of educational games for kids and virtual manipulatives for teachers. The focus is on K-3 but fun for older kids too, even fun games for teachers. Totally free to use and really high quality (not that I’m biased or anything 🙂 ). Got to know about a new website http://www.grade1to6.com and they are amazing with nice worksheets of English and Maths. It has worksheets only upto grade 6. We used it for our new batch of students and they loved it. One amazing website we use is http://www.grade1to6.com. If you’re looking for quality math resources, including worksheets, animated teaching calculators and more, I’d invite you to visit https://www.dadsworksheets.com! The site is completely free and doesn’t even require a registration or sign-up to access all the printed materials. There are over 8000 printable PDF math worksheets with answer keys, animated teaching calculators for long division, multiplication, factoring, and so much more… I hope you’ll stop by and say hello! Great article to align teachers with modern day teaching. Really helpful for teachers.keep up the good work. Free Learning Websites – Welcome to Bibloteka free Study Materials websites. If you get much advance study Materials then get free books to download pdf and much more. Designed to give parents and teachers resources for encouraging a love of reading in their children, https://readmeastoryink.com has over 120 free printable stories by award winning authors perfect for reading aloud at the elementary level. It also includes recommended reading lists for various ages, links to other wonderful children’s site and a growing number of audio stories perfect for family or classroom listening. Try http://www.teacherstack.com for managing and running station rotations! I would recommend ‘Ideas for English Lessons’ with a huge number of very interesting ESL games.